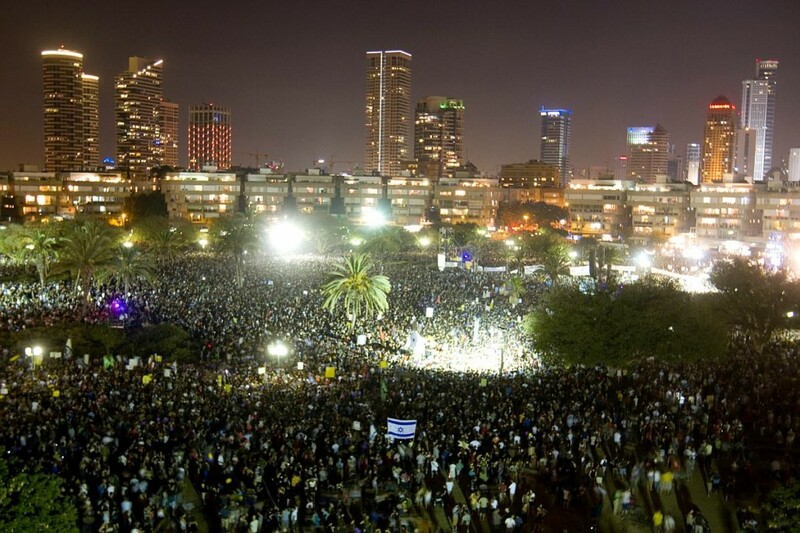 In what organizers are proclaiming to be the largest social protest in Israel’s history, hundreds of thousands took to the streets of Tel Aviv and other cities Saturday night to protest the high cost of living in the country and demand government action. Workers across Italy went on strike yesterday as the center-right government of Prime Minister Silvio Berlusconi rushed to secure parliamentary backing for austerity measures vital to keep European Central Bank support. More than 2000 people marched through the streets of a Glasgow suburb on Sunday to protest plans to build a massive waste incinerator. Several hundred Haitians demonstrated Monday in support of an 18-year-old man who says he was sexually assaulted by peacekeepers from Uruguay on a U.N. base along the southern coast of Haiti. Several thousand protesters from major unions and leftist groups rallied in central Madrid last night to demand a referendum on the proposed cap on long-term budget deficits. More than 100 jailed Bahraini activists – including doctors who treated injured protesters during months of anti-government protests and crackdowns in the Gulf kingdom – are on hunger strike. Immigrant rights groups chanted “Jesus was an immigrant” under the New Mexico governor’s office Tuesday as lawmakers returned to Santa Fe for a special session that may include a proposed repeal of a law that lets undocumented workers get New Mexico driver’s licenses. Thousands of nurses and supporters descended on their local Congressional offices nationwide last Thursday, demanding that Wall Street pay for the crisis it created. Thank you Lestin! You are absolutely right. I’ve tried to purge that word from my vocabulary, but in the hurry of getting this posted today, I ended up using the words of the original article—not my own. Unfortunately the Associated Press has yet to make the proper distinction between law and people.